Maxstor is only Perforation & Bin trolley manufacturer and supplier in India who introduce this product as economical and cost efficient storage systems. It is suitable especially for hand tools and inventories. 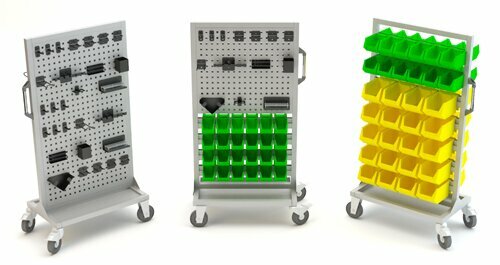 Perfo and Bin trolley are designed for easy access over tool storage. Perforation trolley has perforation panel which featured with flanges and reinforcing strips to provide high strength and great rigidity. There are wide range of hooks for placing tools like spanner, scpaer, files, drivers, cutter, Allen keys, power tools and wrenches etc. Perforation and bin trolley are very use full at assembly process, as you take to tool room place the tools and take to assembly area. Tools hanged on perforation trolley is advantage to single hand working, where you need one after another tools. You don’t need any person to hold your tool, you can put it on hooks and take back as when you need. Perforation and bins trolley save your time by eliminating the searching of tools during, before and after of your job. Robust and rigid steel welded structure having pillars and cross supports. Perforation panel reinforced with stiffeners for great rigidity. Wide range of hooks for placing all types of hooks. 100mm / 150mm diameter wheels 2 revolving with brakes and 2 fix.